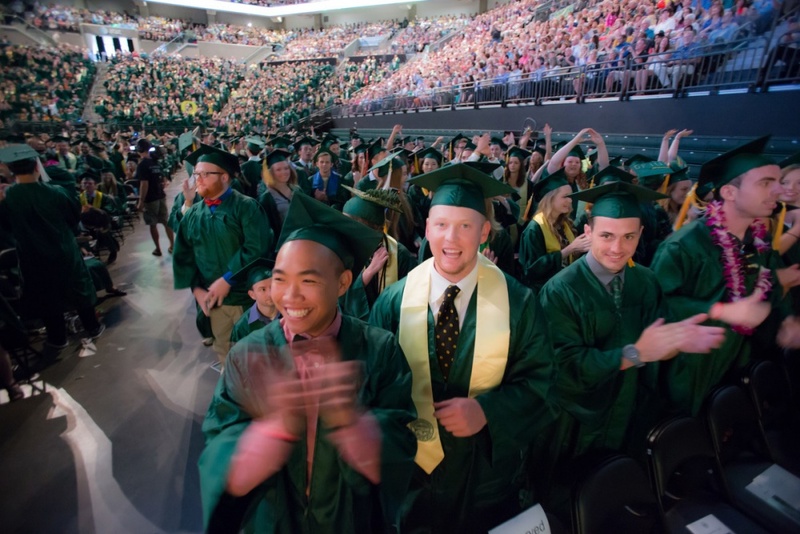 Due to limited seating in Matthew Knight Arena and to assist with crowd control during this year’s universitywide commencement ceremony, graduating students will need to register to reserve a seat and tickets will be required for guests. The UO will recognize the achievements of the Class of 2017 on Monday, June 19. The main University Commencement Ceremony will begin at 9:30 a.m. at the arena, followed by a full day of graduation events. Graduates who register for a seat before May 10 will receive two free guest tickets; after May 10, any available guest tickets will be distributed equally between already-registered graduates and new registrations. The main ceremony will be streamed online, and overflow spaces on campus will accommodate guests without tickets to view the livestream. Tickets will not be required for department ceremonies, where graduates receive their diploma covers. Prior to the main ceremony, faculty and staff are encouraged to gather along 13th Avenue for the Grad Parade, which begins at 8:30 a.m. Cheer on graduates as they make their way from the Erb Memorial Union to Knight Arena. Volunteer opportunities are also available for commencement-related events. Faculty and staff who would like to help are asked to fill out a contact form. For more information, go to the University Commencement Ceremony website.